Look at my baby dragons,” says three-year-old Rubens, gently stroking three polished stones. “They are sleeping now. Shhhh,” he whispers. Sitting under a tree nearby, two other boys hammer sticks into the ground. They are building a house for “the little people” – wooden figures, which staff have provided to inspire the children around this week’s theme of ‘small world’. “I prefer to bounce on a branch,” announces Ada, four, who is perched perilously at the end of a low bough, her blonde hair flowing. “In a regular classroom, children have all sorts of colourful toys and set activities, but here they have to use their imagination and assess risk. For example, ‘is this branch safe?’”, says the fantastically named teacher Wild Bottomley, seeing me glance anxiously at Ada. Every month, staff set up a new camp near interesting features such as a stream or low branches. Then the children are let loose to climb trees, build dens, create fantasy worlds in their minds, pick up worms, play in puddles and learn to care for the environment. In doing so, they cover all areas of the early years curriculum, Shaw notes. Nature deficit disorder, the term coined in 2005 by the US author Richard Louv, has become a well-known concept. Alienation from nature, Louv suggests, leads to diminished use of the senses, difficulties with paying attention and higher rates of physical and emotional illnesses. But the sadness behind the phrase really hit home to many in 2016, when a report by Unilever found that three-quarters of UK children spend less time outside than prison inmates. While some sought to assign blame – risk-averse parents? Schools? The government? Mobile phones? 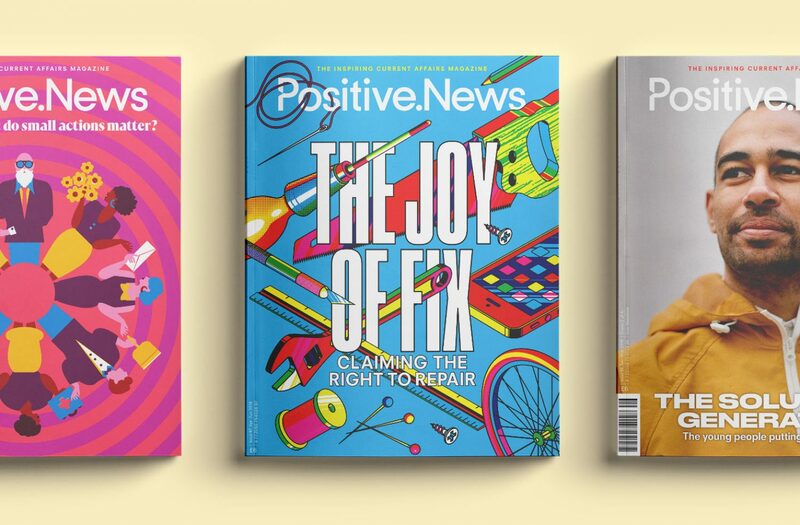 – others got on with designing solutions. Shaw had a sense that children could be healthier and happier if they spent less time climbing the walls of a classroom and more time climbing trees. 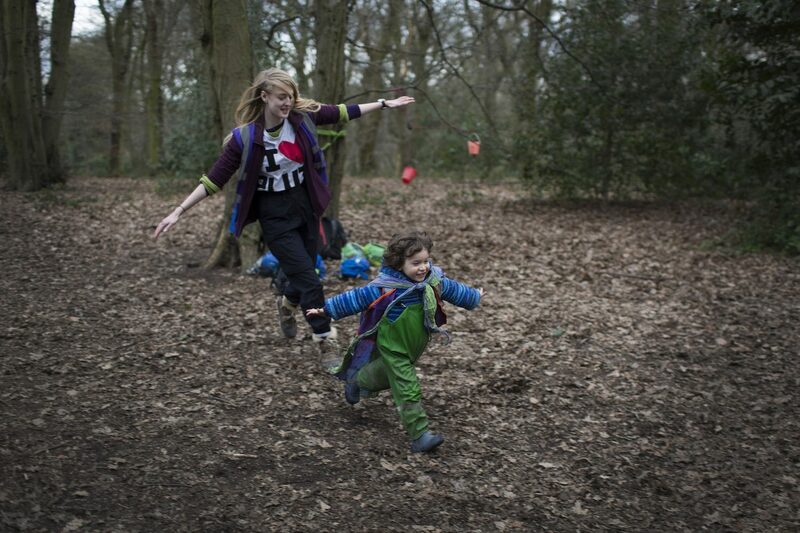 When she opened Into The Woods in 2014, it was London’s first outdoor forest nursery and only the second in the country. The idea proved so successful that she opened a second on the woodlands and meadows of nearby Hampstead Heath. 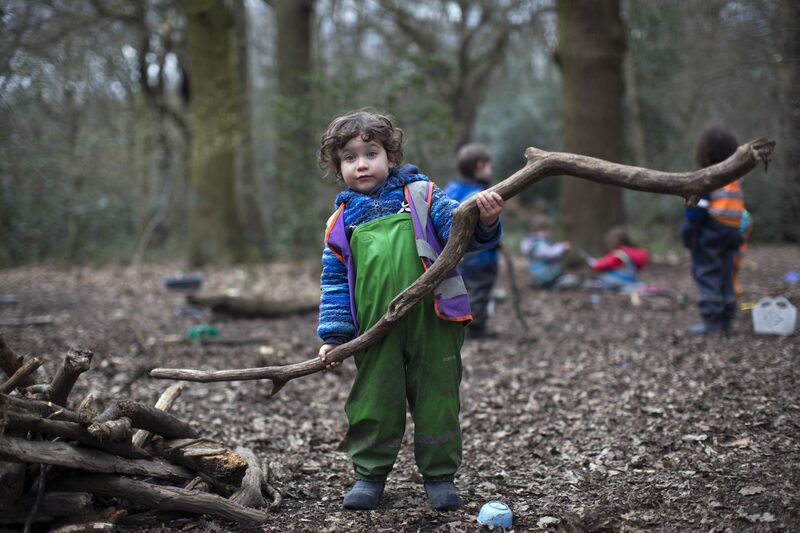 Another outdoor nursery, Little Forest Folk, which is based in five London parks and woods, has a waiting list of 2,000. Drawing on the Scandinavian model of Nature Kindergartens, Forest Schools were developed in the UK in the 1990s by educationalists at Bridgwater College in Somerset. It grew slowly at first, but expanded dramatically from 2010. The Forest School Association (FSA) has 2,000 members – schools that follow Forest School principles as well as people who have been trained by FSA: more than 10,000 teachers to date. There is also a growing demand for the UK’s more structured Forest School approach in the US, Canada, New Zealand and Australia, as well as China, Thailand and South Korea. 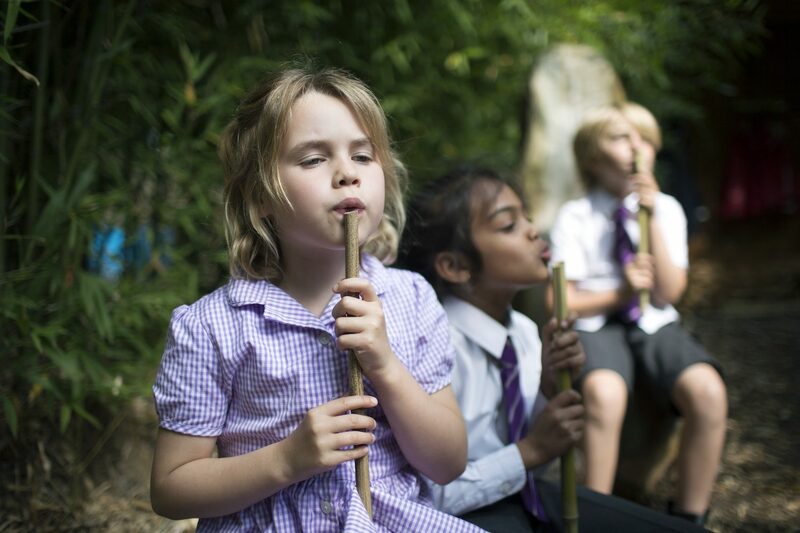 But thousands of other UK schools are developing their own outdoor learning too. One of them is Ark Franklin Primary Academy in Kensal Rise, where all children have one outdoor lesson a week, in addition to after-school clubs. 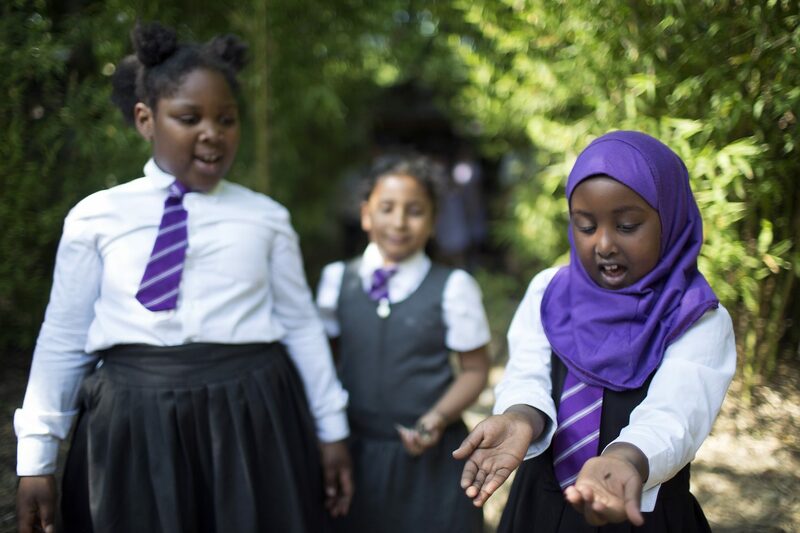 “Our outdoor lessons include science, literacy and maths, but also foraging, weaving and everything we think will be useful,” says principal Janine Ryan. 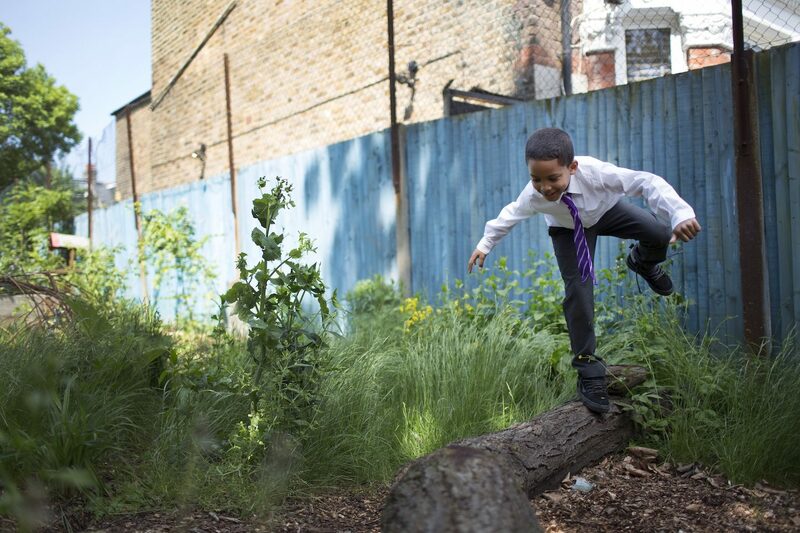 The school’s outdoor programme started in 2014, when chef and food writer Thomasina Miers, who lives nearby, suggested that the school turn a piece of derelict land on its site into a garden. The idea took root, the land was turfed, and a garden was designed based on pupils’ ideas. It contains a green oasis of a storytelling grove, a bug hotel, a vegetable garden and an eco-cabin complete with living roof. The necessary cash was raised through auction suppers and a food festival. “Students always say that outdoor learning is their favourite lesson,” notes Ryan with a smile. On the day I visit, 30 five to seven-year-old children sit in the storytelling spot, perched on stools made from tree stumps that are arranged around a fire pit. Outdoor learning teacher Ben Palmer-Fry hands out bamboo ‘flutes’, which the children gathered from the bamboo grove earlier in the year. Palmer-Fry shows them how to position their lips to make a flute-like sound, and the children practice. In colder months, he often lights a fire in the pit, cooking with the children’s help all kinds of seasonal, foraged food: from apple chutney and bread to vegetable kebabs. Other activities include making mud pies, dressing up and imitating animals. “I love the outdoor classroom because I get to see lots of animals and nature. Mr Palmer-Fry told us that in one handful of dirt, there are more than 100 creatures,” says seven-year-old Tatiana. “Nature breeds curiosity; it helps grow explorers rather than robots. Planting things connects us viscerally with the soil, the plants and the animals. It reminds us that we are part of something bigger. It grounds us, calms us,” says Palmer-Fry. All the outdoor education teachers I speak to say their child charges are healthier, more independent, confident, creative, socially minded and caring for the environment following outdoor lessons. This is slowly being confirmed by research although, so far, there lacks a nationwide study that considers outdoor education from multiple angles. At the moment, if a school offers it, it is largely because individual teachers see its benefits. “If we agree that outdoor education promotes these positive qualities, then it would make sense to give all earlier years teachers some sort of qualification in it,” says Gareth Wyn Davies, chief executive of the Forest School Association, who has been advising local authorities on the topic. Slowly, he believes, policymakers are getting on board. “We are on the cusp,” he enthuses, “of influencing national policies”.